Two new advanced laboratory buildings for high-precision science and measurements have officially opened in Boulder, Colo., providing upgraded facilities to support technology innovation and economic growth as well as the training of future scientists. 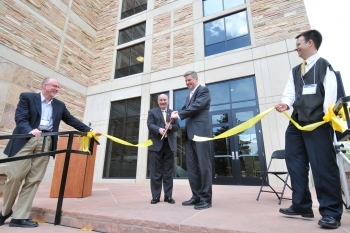 Federal, state and local government officials, university leaders, and Nobel laureates were among those attending the April 13, 2012, dedication ceremonies and tours at the new Precision Measurement Laboratory (PML) on the National Institute of Standards and Technology (NIST) campus in Boulder and at the new X-Wing at JILA, a joint venture of NIST and the University of Colorado (CU) Boulder. JILA is located on the CU-Boulder campus. Both new laboratories tightly control environmental conditions such as vibration and temperature, as is required for cutting-edge research with lasers, atomic clocks, nanotechnology and other areas of study at NIST and JILA. Both new buildings also have capabilities for micro- and nanofabrication of custom research devices. The original NIST-Boulder and JILA laboratories were built in the 1950s and 1960s. Under Secretary of Commerce for Standards and Technology and NIST Director Patrick Gallagher cut the ribbon to officially open the PML, which will house some of NIST's best-known experiments and technologies, including NIST-F1, the U.S. civilian standard atomic clock. Acting Deputy Secretary Rebecca Blank traveled to Boulder, Colorado this week to visit some of the department’s state-of-the-art facilities run by the National Institute of Standards and Technology (NIST), the National Telecommunications and Information Administration (NTIA), and the National Oceanic and Atmospheric Administration (NOAA). 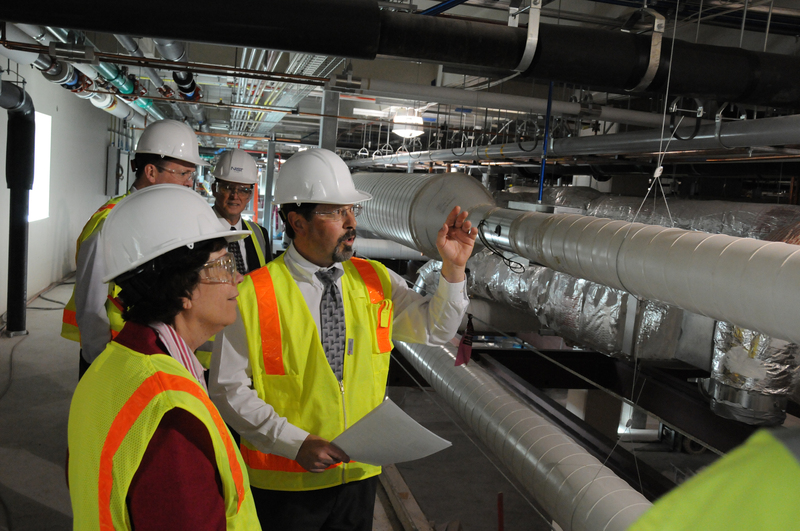 Her four-hour tour included stops at the nation’s time standard, NIST's F-1 Cesium Fountain Clock; the quantum devices group where NIST scientists study and make volt standards, photon detectors and quantum computing chips; the temperature, humidity and vibration controlled Precision Measurement Lab, under construction at NIST and due to be completed in the spring of 2012; and NTIA's radio, video and audio labs at the Public Safety Communications research facility. At NOAA, Blank saw demonstrations of a unique visualization tool, Science on a Sphere; toured the Space Weather Prediction Center and the National Weather Service’s Forecast Research Center; viewed a demonstration of the wind profiler model; and visited the Global Monitoring Division and the Environmental Data Archive. The cutting-edge work that takes place at the department impacts the daily lives of the American people – from the accurate timekeeping ability of the Atomic Clock to high-tech weather forecasting capabilities to the continuous improvement of communications devices used by first responders. The scientists and researchers at NIST, NTIA and NOAA are leaders in research and development and help to keep the United States at the forefront of innovation and global leadership.